The Intelligent Leadership Code: The 7 Secrets to Leading Others and Leaving Your Legacy (John C. Wiley & Sons, 2019). In today’s business world, we find ourselves in a conundrum: all businesses crave superior leadership, yet there remain relatively few truly great leaders. While there have never been so many books, blogs, speakers, and seminars on leadership, companies are having difficulty finding and grooming the next generation of leaders to handle the fiercely competitive atmosphere and lightning fast pace of change that defines our era. John Mattone has found a solution to this leadership paradox and developed an approach that cuts right to the core of what holds leaders back from greatness. It’s what has made him one of the world’s top executive coaches, and what has drawn Fortune 500 CEOs—from the late Steve Jobs to PepsiCo’s Roger Enrico—to seek his counsel. And fortunately for the business world, Mattone’s secrets are no longer being shared exclusively in boardrooms and executive suites, but now also in his newest book, The Intelligent Leadership Code. What makes Mattone’s approach to leadership intelligent is his focus on helping aspiring leaders to develop what he calls their “inner core,” which requires that they get in touch with their deeper purpose, strengthen their character, and clarify their values. This sets Mattone’s philosophy apart from the many leadership approaches that try to “steal first base” by skipping over this more foundational inner work and focusing on the “outer” competencies—things like strategic thinking, decisiveness, the ability to hold complexity, and the drive for results. And while these “hard” skills are important for competent leadership, Mattone has found that developing the inner core is the key to unlocking deeper leadership potential, and really moves the needle in improving a leader’s performance. In fact, Mattone has found again and again that a leader’s capacity for improvement in all of the “outer” competencies is entirely dependent on the strength and depth of their inner core. The Intelligent Leadership Code is the connective tissue that weaves the inner and the outer together. The Intelligent Leadership (IL) Code Model shows how the inner-core connects to the outer-core and in fact enables the outer-core skills and behaviors to emerge strong and vibrant and stay strong and vibrant. As a leader, if you have a developed, refined and strong IL Code this will mean two things for you: (1) your outer-core will be seen by others as stronger meaning that you will be seen as highly skilled and talented in those competencies; and (2) your skills and competencies will only get stronger to the extent that you believe in, embrace, internalize, embody and role model each of the 7 pillars that comprise the IL Code. According to Mattone, just like your fingerprint and personality, your IL Code in unique to you. It is the “connective tissue” that uniquely weaves your inner-core and outer-core. Just like the connective tissue in your body that preserves and protects your bones (e.g., such as your tendons) while at the same time supporting and giving strength to your muscles, a strong IL Code will protect and preserve the strength, vibrancy, maturity and integrity of your inner core while supporting and facilitating the emergence of skills in your outer-core. 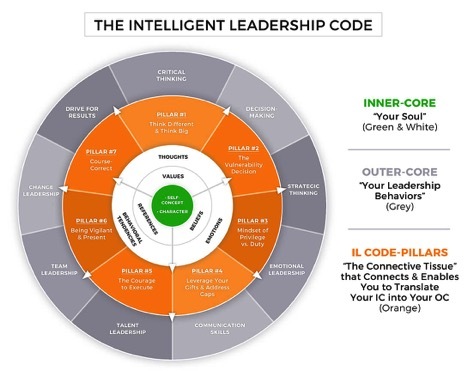 In the IL Code Model, notice the orange ring surrounding the perimeter of your outer-core, this symbolizes both the power of your unique IL Code as well as the support it provides to the emergence and development of your leadership competencies and skills. Your IL Code encapsulates your outer-core. Your IL Code is a blend of both inner-core elements—your soul (self-concept, thoughts, attitudes, beliefs, values, character, emotions) and “ignitor” behaviors have the potential (i.e., as your long as your inner-core and “ignitor” behaviors are working in concert) to ignite both the emergence of strong leadership behaviors in the outer-core but also ignite continuous growth and development of those same leadership behaviors and competencies. Mattone is saying that your continuous growth as a leader and truly becoming the best that you can be as a leader and person, cannot be accomplished unless you commit to strengthening and maturing your inner-core combined with your embracing, internalizing, embodying and role modeling your unique IL Code. Perhaps now we see why we have such a massive leadership gap in the world. Very few leaders Mattone has coached and worked with all over the world, including some of the top CEO’s in the world and government leaders, before he started coaching them–had ever done this deep inner-core work, let alone had even thought of its importance and if they did, frankly lacked the courage to do so. Add to this, very few business books written today and even fewer leadership development programs, university management development programs offered by the biggest name universities in the world, and even fewer executive coaches—yes, some of them the biggest names in the industry, appear oblivious to the role the inner-core plays in determining the real, authentic growth of leaders. To Mattone, it has always been common-sense to see that outer-core skills and behaviors—in leaders, parents, students, what’s required to build and sustain marriages, etc., is all ignited from the inside. If the inside is “right”, we increase the chances that the outside becomes “right”. The IL Code in many respects Mattone doesn’t see as a massive discovery, yet he sees its potential in creating the very much needed disruption and “revolution” to how we grow and develop the best leaders and future leaders in the world so we all create greater abundance and fuel our own individual legacies and sustain humankind. John’s Definition of Executive Coaching…. This definition provides the powerful foundation upon which the Intelligent Leadership (IL) Executive Coaching Philosophy, Process and Program was created. 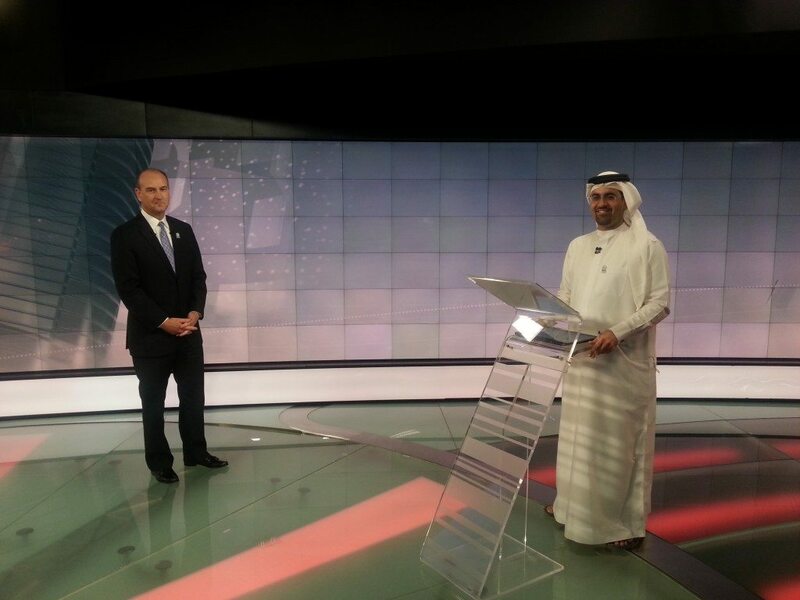 We believe there is a massive gap in leadership all over the world–in governments, in businesses, in families. We believe the key to solving the leadership gap challenge lies in helping leaders and future leaders unlock and unleash their full potential so they can positively touch the hearts, minds and souls of the people around them–their business stakeholders, their loved ones and the world. We believe that to become a great leader requires that leader better understand, embrace, ignite and then translate what they learn about their “inner-core” (their self-concept, character, values, thinking patterns, emotional make-up, etc. ), into driving greatness in their “outer-core” (their behaviors and skills). We believe the best answer to solving the global leadership gap challenge lies in providing and teaching executive and life coaches (and, aspiring executive and life coaches) with a proven and powerful coaching IL philosophy, process and tools. Coaches who master IL will bring greater abundance to the world through helping and enabling their clients achieve the same and in so doing, every coach we have the privilege to call our IL Family Member, will have the opportunity to realize their own dreams of building their businesses and brands as coaches and realizing the rewards and successes they so richly deserve. 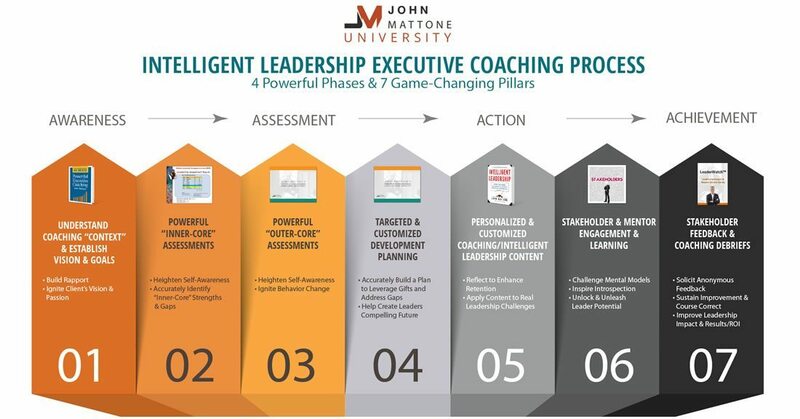 John Mattone’s Intelligent Leadership (IL) Executive Coaching Process is based on 4 powerful coaching phases and 7 game-changing pillars. Building rapport, trust and credibility with the client quickly. Laser-focusing on understanding the “context” of the coaching assignment and igniting the clients vision, goals and passion. Strength, vibrancy and maturity in the “inner-core” drives greatness in the outer-core. The IL Coaching Process uses the Mattone Leadership Enneagram Inventory (MLEI), a powerful “inner-core” assessment that has ignited the leadership development of over 6,000 global leaders including the late Steve Jobs. Prescription before diagnosis is malpractice. The IL Process supplements the MLEI with two other “inner-core” assessments and John Mattone’s proprietary Strategic-Tactical Leadership Index-360 (STLI-360) and stakeholder interviews, to help leaders accurately identify their leadership strengths and gaps. Designing actions that leverage gifts and address gaps. Leaders begin by creating and internalizing their Core Purpose Statement (CPS). This enables a clear definition of “the essence” of who the leader is and who they must (bigger than “want”) become. The IL Process then provides leaders with a powerful, proprietary tool, The Assessment-Driven Individual Leadership Planning Tool (ILDP), that enables them to design custom, personalized opportunities for learning and taking new actions, consistent with their core purpose. The client learns from the coach, but most learning happens through self-discovery and the involvement and input from stakeholders and mentors. The IL Process both ignites and reinforces the value of introspection and making the decision to be vulnerable and, therefore being open to the views and feedback of others, as the key drivers in behavioral change. What is measured, will improve. Stakeholders and mentors are surveyed every three months, after the ILDP is created, using John Mattone’s LeadersWatch Mini-Surveys. Clients are held accountable through this process to improve their leadership impact and demonstrate ROI both for the leader and sponsor organization. 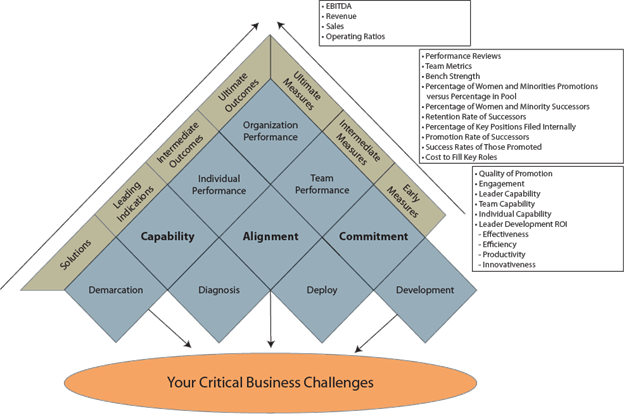 The “Stealth Fighter” Model offers a compelling, symbolic way to understand the predictive relationships that exist between critical human capital/talent processes (the 4 D’s), critical “leading indicators” (capability, commitment and alignment—more on these later), intermediate outcomes and ultimate outcomes. The 4 D’s essentially act as the 4 turbo-charged engines that propel the “Stealth Fighter” towards its’ target—defined as an organization’s “Future Desired State” and the required leadership competencies to execute both the current and future business strategy. By way of analogy—if the 4 engines are “well oiled” and functioning at a high level (i.e., optimized) and working together (i.e., integrated), they will propel the “Stealth” towards its’ goal. In practical terms, an organization’s Talent Leadership Value Proposition (TLVP) is the holistic sum of the following practices: (1) Demarcation-performance management; (2) Diagnostic—objectively assessing leaders and potential leaders; (3) Deployment-recruiting, selecting and promoting leaders, future leaders and individual contributors who possess the highest probability of being successful; and (4) Development—coaching, on-the-job development and training programs—- and their relative impact on multiple levels of organizational outcome—such as capability, commitment and alignment (leading indicators), intermediate outcomes such as individual and team performance, bench strength, percentage of women and minorities promotions versus percentage in pool, percentage of women and minority successors, retention rate of successors, percentage of key positions filed internally, promotion rate of successors, success rates of those promoted and cost to fill key roles (lagging indicators), and ultimate outcomes such as organizational revenue, profits and operating ratios. Regardless of the exact words used to capture a given organization’s TLVP, one thing is sure, the elements identified in the “Stealth” need to be well thought out, believed in, communicated, executed, and measured (assessed)—continuously. At its core, a great TLVP encompasses everything leaders and future leaders experience and receive as they are employed by the organization—including the degree of engagement they experience, their comfort and “fit” within the culture, the quality of leadership, the rewards they experience, etc. A great TLVP always encompasses the ways in which an organization fulfills the needs, expectations, and dreams of leaders and future leaders. More than anything, a great TLVP clearly connects winning talent practices to business and operating metrics. As was discussed earlier, there exists no better way to create the belief in the value of the human capital asset, than by demonstrating the connectedness between winning talent practices and operational success. The research is clear and compelling. Organizations with the most mature talent capabilities (i.e., the 4 D’s) had significantly greater EBITDA, net profit, return on assets, return on equity, and operational results than those organizations who were immature in their talent management processes. Additionally, mature talent organizations had leaders who believed in the value of the human capital asset, were passionate about investing in building and growing talent, were relentless in their assessment of leaders, individuals and teams, and shared their human capital responsibilities with line managers and the Human Resources function. To what extent does your organization develop the inner-core (i.e., values, character, thoughts, beliefs, emotional make-up) and outer core competencies and skills of employees and leaders at all levels? Is there a passion and diligence displayed on the part of the senior leadership team to equip leaders and individual contributors with the skills required for individual and organizational effectiveness now and into the future: skills that increase people’s learning agility, change/transformation agility, and people agility? To what extent is your organization creating a culture of “can do”, in which people truly believe they have the skills and capabilities required to be successful and help the organization be successful? To what extent is your organization’s vision, mission and purpose one that excites and motivates leaders and employees? To what extent is authority and responsibility delegated to those who have the most up-to-date information and best information to make the best decision? To what extent do people truly believe that they can impact the business in a positive way and add value to customers and society? Are people motivated, passionate and inspired to do great things for the organization? To what extent is there a reasonable risk-taking culture in place in which people believe they can take risks and failure is seen as an opportunity to grow and become better? To what extent is there a clear vision and strategy for the organization? To what extent do different parts of the organization and different levels share the same vision for the organization? To what extent is cooperation and consensus possible when different parts of the organization and different levels work together? To what extent are leader’s visionary and possess a long-term view? To what extent has the vision, mission and strategy been translated into a structure with key roles identified so that everyone knows their role and the link between their contributions and the contributions of the whole? To what extent are people so “connected and aligned” with the vision, they feel they “must” execute at a high level? To what extent is there a culture of individual excellence and execution? To what extent are leaders and employees truly “role models”? To what extent does everyone “walk the talk”? Does everyone operate with strong character and values? Are they effective leaders in how they go about their work? Are employees effective in how they go about their work? Are leaders and individual contributors open to receiving feedback from others—including customers? Are leaders and individual contributors actually listening to feedback and making needed adjustments? To what extent is there a team and collaborative approach to getting things done in our organization? To what extent is there real involvement by everyone in helping shape the organization’s vision, mission, purpose, strategy, structure, roles and key responsibilities associated with those roles? To what extent do we have a cooperative, non-siloed approach to getting work done? To what extent is there a passion and inclination when conflicts and disagreements occur, to work hard to achieve win/win solutions? 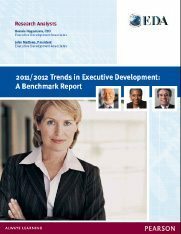 John Mattone, President of JMP, Bonnie Hagemann, CEO of EDA, and John Maketa (Pearson) are the co-authors of the bi-annual 52-page 2011/2012 and 2014 Trends in Executive Development Research Reports–which are widely regarded as one of the most authoritative and respected global research studies in the field of leadership development and talent management. 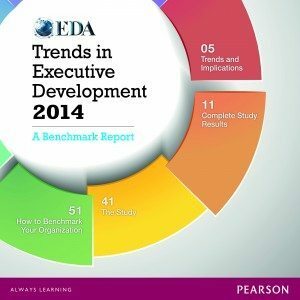 JMP,EDA and Pearson are dedicated to helping its’ clients and colleagues stay abreast of the leading trends, growth and evolution of executive development in today’s dynamic business environment. The Reports along with the companion executive summary and highlight reports are available from JMP. Please contact us for more information and to reserve your copy.